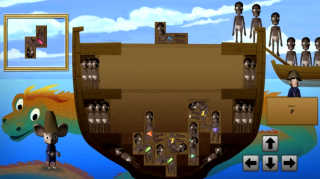 A couple of years ago, a studio called Serious Games Interactive released an educational game called Playing History 2—Slave Trade. That's dicey subject matter for any medium, let alone one with no real history of effectively handling sensitive topics, but the game went up and nobody said much about it—until this past weekend, when, as Eurogamer explains, somebody noticed that it contained a mini-game that was essentially Tetris, but with slaves. Slave Tetris is exactly what it sounds like: You must pack tetromino-like slaves into the hold of your ship, in order to take as many as you possibly can back to England. And as you might guess, depicting that horrific slice of history in a mini-game did not go over well with an awful lot of people, which eventually led the studio to remove it. "Slave Tetris has been removed as it was perceived to be extremely insensitive by some people. This overshadowed the educational goal of the game," the Denmark-based studio wrote on Steam. "Apologies to people who was offended by us using game mechanics to underline the point of how inhumane slavery was. The goal was to enlighten and educate people—not to get sidetracked discussing a small 15 secs part of the game." Interestingly, and I suppose predictably, the Slave Trade Steam forum is now largely a blend of outrage over the game's perceived racism, met with outrage that Slave Tetris has been removed. One post calls the developers "[a] disgusting racist POS," while another says he's going to demand a refund because content was cut without notification. Serious Games Interactive founder and CEO Simon Egenfeldt-Nielsen, meanwhile, has posted a message explaining the rationale behind the game, and Slave Tetris in particular. "I definitely agree it is insensitive and gruesome. It has to be like this to show what was done to load slave ships," he wrote. "People treated human beings as pieces that just had to fitting into the cargo. The reactions people have to this game is something they will never forget, and they will remember just how inhumane slave trade was. If this is the case then we have accomplished what we set out to do. You may not like the way we do it, but I have seen enough school classes use this to know it has the intended effect—a lot people never think of slave trade as something that just happened in the past." In a follow-up post, Egenfeldt-Nielsen said he was surprised by the outcry, but decided to remove Slave Tetris because "it was clearly such a red [flag] for a lot of people, and it shadowed the rest of the game." He defended the game in comments to ThinkProgress, however, saying it has won educational awards in Europe and ascribing at least some of the uproar to cultural differences with the US. "We just tried to make a game to teach about what we thought was an important topic. We did spend a lot time doing it, We did consult with experts. We didn’t set out to make a racist or inflammatory game. Actually the opposite—a game where you would understand slave trade from the inside by escaping slavery," he said. "I have reached the conclusion that no matter what we had done it would have been wrong."